alaTest ha raccolto ed analizzato 22 recensioni su Remington WPG 4030. La media della valutazione per questo prodotto è 4.2/5, confrontata con la media della valutazione di 4.3/5 per altri prodotti. Abbiamo analizzato differenti valutazioni di esperti ed utenti, età del prodotto ed altri elementi. A confronto con altri prodotti, Remington WPG 4030 ha ottenuto un alaScore™ complessivo di 85/100 = qualità Molto buono. This is easily held and used. However the blades are a little on the rough side which can make the shaved area sore. Good product nevertheless. Great value, managed to purchase when on sale for £12 and the battery life is good and like the fact it's a mains charger like previous trimmer I had for 8 years. Does what it should well ! Small, light, long battery life, various fittings for specific grooming needs ! All in all a good quality product. Received this the other week and I found it really easy to use with no fuss! I'd highly recommend! Works well without the guard without 'nipping'the skin as others I have tried in the past tend to do. Size of head great for smaller areas! 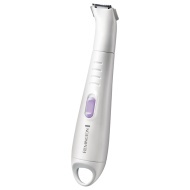 I bought this after buying a more expensive lady shaver (which was rubbish) and I am so pleased with this trimmer.\nThe small head means you can get those harder to reach areas and the price is very good. Loads of accessory a as well. I bought this last month as my old one had given up. I've only used it once and am very happy with the way it works and the precision. My only gripe is the length of time it takes to charge. My first shaver in my life and it worth every penny I spent.. Works very nice.